The ListObjects property of the Worksheet object returns the ListObjects collection. The ListObjects collection contains all the list objects on a worksheet. The ListObject object is a member of the ListObjects collection. Each ListObject object represents a table (previously known as a list) in the worksheet. An Excel table typically contains related data in a series of worksheet rows and columns that have been formatted as a table. 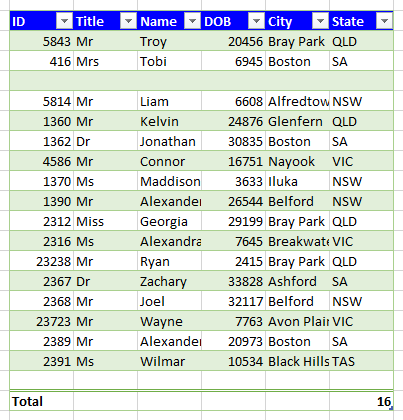 By using the table features, you can then manage the data in the table rows and columns independently from the data in other rows and columns on the worksheet. Here is how a table (list) looks like. It can be identified by a small blue arrow at the right-most bottom-most cell of the table. 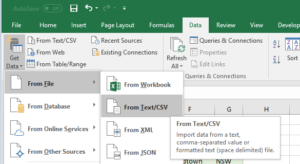 Whenever you import data from a file (Excel / Text / XML / JSON) or from a database (SQL / Access), the imported data is always in the form of a table. 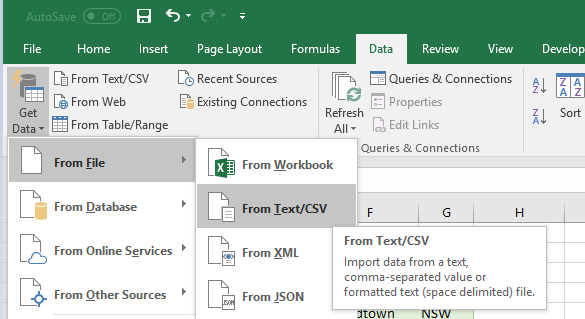 You can also convert the selected range in Excel to a table by using the Format as Table option. 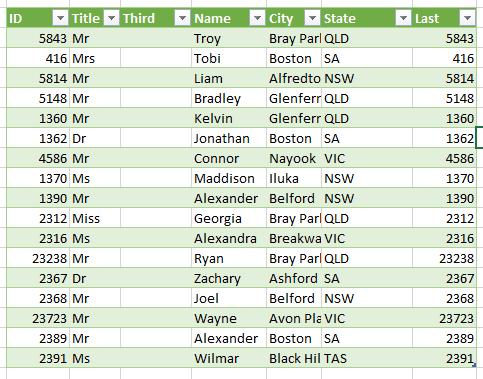 For that simply select your data range, in the home tab, go to “Format as Table” and select the desired formatting. You will asked to confirm the selected data range and whether your table has headers. 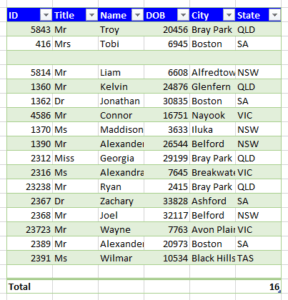 Input the data and click on OK and a table will be created. To convert a table back to normal range, use the convert to range option. For that, click anywhere on the table, the design tab will be visible. In the design tab, click on convert to range. 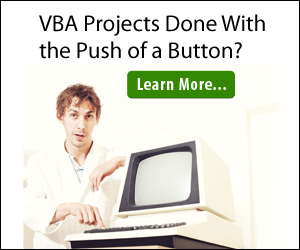 Now, that we know what is a table let us look at how to use VBA to modify these tables. 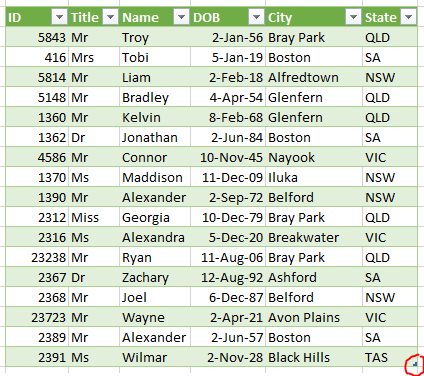 The code below creates a new ListObjects collection which represents all the tables in a worksheet and displays the name of each of the table in the collection. The code along with the comments is self-explanatory. The name of the table can be seen in the design tab. Select any cell in the table and the design tab will be shown. The name of the selected table is seen in the left side of the tab. You can edit it from here. 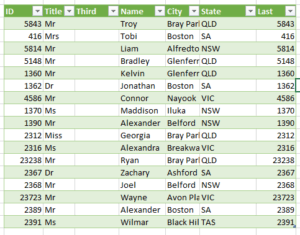 You can also see a list of all the tables in the workbook along with their names and ranges in the Name Manager (in the Formulas tab). In this example we will see few of the most common operations that you can perform on the table columns. 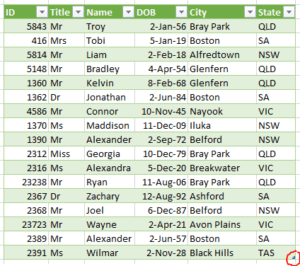 Namely, looping through all the columns of a table and printing their names, inserting columns at the end or at a specified position, deleting a particular column and copying only the data from a particular column. In this example let us have a look at some of the row operations in a table. As with columns, you can loop through all the rows, add and delete rows, work with totals row and header row.